Throughout the month of June I’ve been tweeting what the day of the week is called in various Canadian First Nations and Inuit languages. Well, today is June 21 and it is also National Aboriginal Day in Canada. The histories of Canada’s First Nations, Inuit, and Métis peoples tell us of peoples with cultures and societies as complex, insightful, and unique as any in the world. These histories are not just of those peoples, but of Canada, and of our shared today. On the National Aboriginal Day website it says, “[Today] is a special day to celebrate the unique heritage, diverse cultures and outstanding achievements of First Nations, Inuit and Métis peoples in Canada.” While we strive to do that today, I think it is also important to think about connecting with Aboriginal history, culture and achievements in a meaningful way, every day. For some Canadians, it may feel as if the Aboriginal peoples in Canada are another culture—that the study of their histories and cultures can seem like studying the history and culture of a group in a far-away land, or in a time long-past. But this is wrong, and those histories, cultures, and heritages are those of the peoples who were here, on the land where I am writing this, and likely on the land where you’re reading this, and indeed on the land across what is today the nation of Canada. We therefore owe it to ourselves, to the Aboriginal peoples here, and indeed to Canada as a collective whole of all of us, Aboriginal and not, to know about the history of our land, and of the peoples who were here, and still are. I would like to suggest, in the spirit of National Aboriginal Day, that you learn about the people(s) who share, and shared, the land you are sitting on right now. And, as this is the page of a Language Museum, that you learn something about a language they speak. For example, as I write this I am in my childhood (and parents’) home in Sarnia, Ontario. The land I am sitting on is that of the Niswi-mishkodewin, or Peoples of the Three Fires. These are the nations of the Ojibwe, Odawa, and Potawatomi peoples. So I have challenged myself to learn some Anishinaabe (or Ojibwe) today, and in so doing also learn about the cultures, and histories of those nations. So that is a little challenge I’d like to put to you today. If you’re reading this you likely love language, and you likely have something warm in your heart for Canada too, and I can’t think of a greater way to marry those two loves than by learning a bit of one of the many languages of one of the many First Nations, Inuit, or Métis peoples who live, and have lived, in Canada. So, miigwech (“thanks “) and giga-waabamin menawaa (“see you later”). This week I spoke with Professor Marie-Odile Junker of Carleton University. Originally born in France, she has come to Canada and fallen in love with our country’s Indigenous languages. 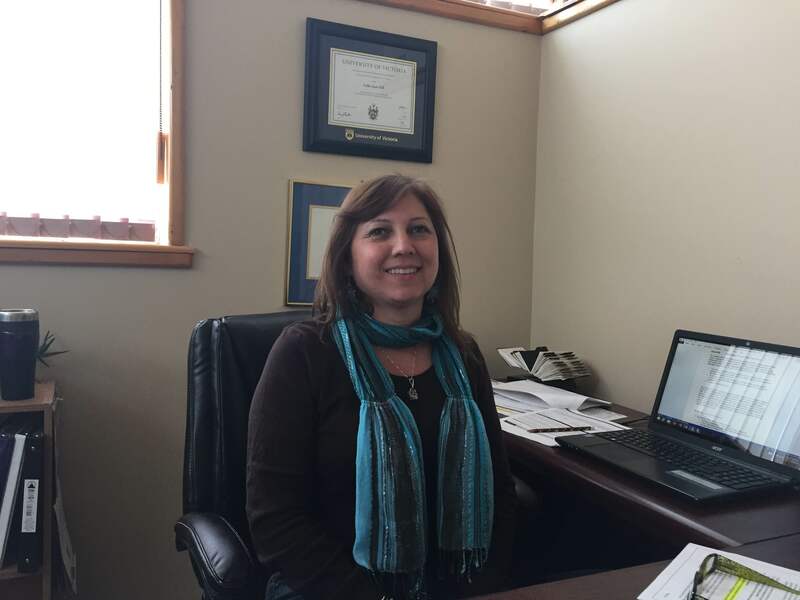 She is an expert in several areas, and excels at bridging disciplines, connecting people, and organizing projects. These are all things that are essential to language documentation and revitalization. She has incorporated technology and digital media into her work on Algonquian languages without ever forgetting the people behind the data. I spoke with her about how she views technology as a tool that can help languages survive, and also about her work on the Algonquian Language Atlas, which incorporates many languages, people, and technologies. You should definitely play with this site (after reading this first!). Michael Iannozzi : What led you to get involved in language documentation? Marie-Odile Junker : Noticing the lack of resources for teaching Canadian Aboriginal languages and also the fact that I “fell in love” with what I find beautifully intricate languages. MI : How did you get involved specifically with the documentation of Algonquian languages? MOJ : As an immigrant from France curious to learn the language(s) of this land, I realized you could learn all kinds of immigrant languages, but not aboriginal languages. In Ottawa, the original language would have been an Algonquian language. MI : Which languages form the Algonquian family? Where are they spoken? MI : What is the general health of the Algonquian languages? MOJ : It depends on the community and the place, some have lost their language, some still pass it on to their children, but most are endangered. MI : Your research focusses a lot on the use of modern technologies for the purposes of language documentation and revitalization; what role do you feel technology has to play in the survival of these languages? MI : Do you feel that technology age has been helpful or harmful to the future of Indigenous languages? MI : What resources did you draw upon to decide how to begin your language documentation? Were there previous successes with other languages that informed how you approached your efforts? MI : Turning now to the large project of the Algonquian Linguistic Atlas, how did you decide to make this project? MOJ : It came little by little, a side project that grew out of speakers’ interest. That is how Participatory Action Research works. In 2002, I made a Conversation CD with 21 topics of conversation for East Cree, as a side project to more fully engage the interest of young Cree speakers who I had hired on a summer project to work on a database of Cree verb conjugations. I was worried that they would not see the end of the Verb documentation project (it took 15 more years to complete!). This CD went viral and soon other groups asked me for permission to adapt it to their dialect. The turning point was after giving a guest talk and a workshop at an aboriginal conference in Prince Albert, in 2004… I was being driven back by two Cree women who had attended my documentation/sound recording workshop (where we were recording common words and phrases of their many dialects), and they were asking me to give them a copy of the map of the Cree-Innu language family I had shown them. They had never understood that they were part of a language family that stretched all the way to the Atlantic Ocean. So it just occurred to me: sounds+map; let’s put it all together! I would like to give credit to those two women for that magical moment. We made a prototype, then funding came, and Google maps became available the same year (2005). At first it was only Cree-Innu, but 3 or 4 years later we had requests from other languages and dialects. We grew to include them and so on. MI : What were the obstacles and challenges of putting together such a large project, with so many people involved? MOJ : Some technical challenges: having to reprogram sustainably (run on cheap servers), having to adapt to contributors’ technical preferences and expertise. We have experienced lots of good will. Some people or groups keep contacting me to join in. It usually just takes a willing person to work with us. They want to be represented there. It is open-access and collaborative, so contributors can do what they wish with their material afterwards. MI : How did the communities involved feel about your efforts, and how do they feel now that they can see the finished product? MOJ : In general they love it, they feel proud to be represented and they enjoy listening to their cousins and neighbours. More recently, the production of mobile versions (apps) is extremely popular. We had over 1120 downloads of the East Cree conversation app on iOS alone. MI : How can a language community promote, document, or revitalize their language through technology? MI : In the past, the role of a documentary linguist was to go in the field and record or transcribe speech; how have the internet and modern devices changed that? MOJ : With the internet, we now see the possibility of crowd sourcing (which is NOT what we are doing in the linguistic atlas). The problem might soon be the availability of too much unstructured, unedited data. The change for me was both in the technology and in the approach. Someone can still go in the field, but use videos instead of pencils to record speech and archive those videos in libraries and depositories, with the speakers being left out of the equation. The use of a Participatory Action Research framework together with the technology is what created the atlas. MI : What is the role of a documentary linguist today? MOJ : Considering the crisis we are facing, with languages disappearing as fast as biodiversity, their role is in its title: “document”, but also help preserve, if not for the current heirs, for the future generations. I would also add “infuse life” in those languages, by working WITH speakers who wish it to survive. Not all wish that, we see alternating generation patterns. For example, there are cases of language reclamation like Sami in Scandinavia, with bilingual grandparents, parents who did not speak the language at all or became second-language speakers of it, and now first-language bilingual grandchildren. MI : What do you think will be the role of a documentary linguist in the future? MOJ : I am not sure, but I suspect they will still be very busy, unless there is nothing left to document. MI : What has been the most important thing you’ve learned through working with Indigenous languages and communities? MOJ : Nothing ever happens as planned, but something interesting eventually happens. MI : What would you like to do next, or where would you like to see the Atlas project headed next? MOJ : We got funding for 5 years to develop a digital infrastructure for Algonquian languages, especially dictionaries. I see the Atlas becoming a portal for those languages’ resources, still with the initial intent of allowing groups not to reinvent the wheel, but also to share educational resources, or anything that is needed to keep their language alive, and let it stay alive with modern communication. A huge thank you to Professor Junker for speaking with me about her great work. Documenting languages is a huge amount of work. Though technology can help spread information quickly and over great distances, without people to use it, you have a ‘tree falling in the forest’ situation. Thanks to open-source data and increasingly user-friendly software, sharing information with people across the globe is easier than ever. The goal and success in documenting and preserving a language is that, even if the community doesn’t need those resources today, we, as a society, leave for future generations the tools to reawaken their languages. 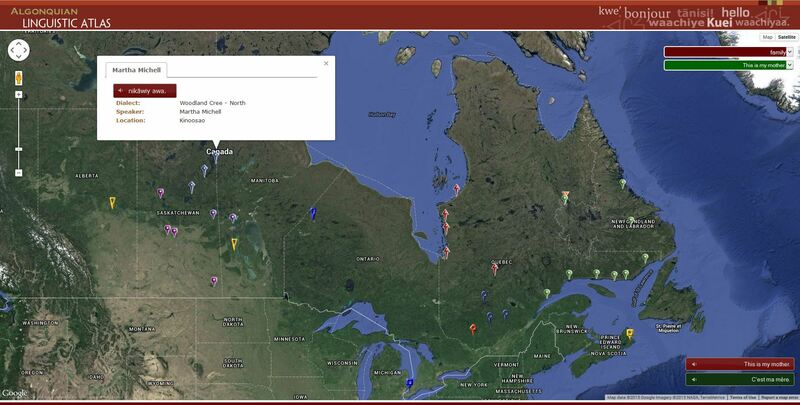 So check out Prof. Junker’s Algonquian Language Atlas, and maybe you’ll feel inspired to start a project of your own! This week I spoke with someone from the Tyendinaga Mohawk Territory, which is the community that is the subject of Raising the Words; a short documentary from Chloë Ellingson. Callie Hill is the Executive Director of the Tsi Tyonnheht Onkwawenna Language and Cultural Centre, and she has a great deal of experience engaging with, and organizing the education of the Mohawk language. As a Mohawk herself, she also relates personally to the significance of losing the Mohawk language. I spoke with her both about the language and how to save a language that needs our help. Michael Iannozzi : What led you to get involved in revitalizing the Mohawk language? Callie Hill : I think that having children was one of the defining moments in my life that made me realize how important the Mohawk language and culture is. And now I have a grandson so it is even more important to me. I am not a speaker, but I do have a base of language knowledge which I have gained from years of taking language programs. I hope to be able to continue learning the language so that I can pass this along to my grandchildren. My parents did not speak, but I did hear my paternal grandfather speak the language, which I don’t recall knowing was indeed Mohawk. He died when I was nine and he was the only person in my family that I ever heard speaking the language. In 2004, I began to work for Tsi Tyonnheht Onkwawenna (TTO) as the Coordinator. At the time that I joined I was the only full-time employee. My role for the past ten years has been to create, develop and oversee Mohawk language programs in the community, which I have been doing as a non-speaker. By this I mean that I have been the Administrator of the programs, and never a teacher of the language. We now have a staff complement of six teachers, one teacher assistant, a part-time curriculum specialist, an Administrative Assistant and myself, the Executive Director. MI :What does a typical day consist of in your work? CH : As the Executive Director of the TTO Language and Cultural Centre, my typical day is administrative work. I write proposals, prepare reporting, oversee the staff and work on new programming. Because my office is at the primary immersion school I also act in the position of “Principal”, so some of my time is helping the teachers in this capacity. So really I don’t have a typical day because you just never know what can happen. We all very much work as a team in every aspect of our organization. Everyone is willing to pitch in and help where they can: being a community, that is what we are all about. For instance, the primary school had a Valentine cookie fundraiser in February and collectively in one day we raised $800, by baking and selling a total of 800 cookies at $1 each – that was a great success! MI : Where do your revitalization efforts take place? CH : Kenhteke (Tyendinaga Mohawk Territory) is a Kanyenkehaka (Mohawk people) territory located in eastern Ontario between Belleville and Kingston. Our land is based along the shores of the Bay of Quinte, which is off of Lake Ontario. Historically, we relocated here in 1784 after being displaced from our homelands in Upper New York State in the Mohawk Valley. Our on-reserve population is around 2,200 people. MI : How are you approaching the revival of the Mohawk language? CH : Because we recognize the importance of inter-generational transmission of the language for it to thrive, we operate programs geared towards different age categories. We have three levels of educational programs: Totahne (At Gramma’s place) Language Nest, which opened in 2007, is a total immersion program for pre-schoolers; Kawenna’on:we (The First Words) Primary Immersion School, which opened in 2011, is for children from Senior Kindergarten to Gr 4; and the Shatiwennakaratats (They are standing the words back up) Adult Language Program, which started in 2004, is a full-time program for adults. The children’s programs are total immersion, and the adult program, while intense in nature, uses various methods to teach the language which includes not only speaking but reading and writing. MI : Do you think your approach would work for others (or all) Mohawk communities? CH : Almost all other Mohawk communities are using formal educational programs such as ours. However our biggest challenge is that we do not have any mother tongue speakers in our community and all of our programs are taught by teachers who have learned the language as an adult. We have one fluent grandmother that works at Totahne as we recognized the importance of having a fluent speaker in that program with the very young children, and we were fortunate at the time to find someone willing to relocate to Kenhteke. Totahne is very much just like spending a day with “gramma” or in our case “Tota”. We also bring in fluent speakers throughout the year in the adult program as it is important for our students to hear language in its most natural form. We network with the other Mohawk communities as we are all in the same situation of trying to ensure our language thrives in our communities. MI : How did you decide to begin this language training and what resources did you draw upon? CH : In 2002 TTO formulated a long-term strategic plan which laid the groundwork for the revitalization efforts in the community; the plan was to teach the adults to speak—teach them to be teachers of the language, so that we could begin an immersion school for children. We have since met these goals through various ways and means. So now we continue to build upon this framework. The organization continues to hold strategic planning sessions each year. MI : Why do you think the language has reached the point where it needs a revival? CH : People quit speaking the language in our community for various reasons but in my opinion they all point back to colonization. In particular I am speaking of the influence of the Church through the missionaries and the Indian Act. I believe these to be the over-arching reasons which led to parents choosing not to speak Mohawk to their children, and once the intergenerational transmission in the homes was interrupted, it lead to the demise of the language in our community. By my estimation we have not had a generation of mother-tongue speakers who used the Mohawk language in daily life since the late 1800’s. MI : How does the community feel about your efforts, and how did they feel when you started? CH : When TTO organized in the late 1990’s there were mixed emotions about revitalization efforts. There was a group of supporters who were very committed to the efforts, and there were also some older people who thought it better left alone, basically to die. I believe the community is supportive of our efforts today. We see support in many ways throughout the community: road signs in the language, people naming their children with only a Mohawk name, people in all our service organizations answering the phones with “She:kon!” (translated in that context as “hello!”), gravestones with Mohawk names engraved on them, the financial support of our local politicians. So I see this as support in many different capacities. MI : What has been the biggest challenge in revitalizing the Mohawk language? CH : Funding of programs is an ongoing challenge and we are grateful to our local government, the Tyendinaga Mohawk Council, who have been very supportive financially. Also in this modern world we live in, I don’t believe people realize how colonized they are – some don’t see any point in learning the language in this materialistic, economy driven world we live in. MI : What do you think is the chance of success for the Mohawk language revitalization project? CH : I have to say that I have total confidence in our efforts to revitalize our language. There is no other acceptable answer in my opinion. I think it is necessary for us to continue to educate the people in our community, and I see through providing education and awareness the efforts will continue to grow. MI : What do you feel is a key factor for the revitalization’s success? CH : I think a key factor is the commitment shown by everyone in the process. From those of us doing the administrative work to the people who are enrolled in our programs and the parents who put their trust in us to educate their children, we all have a vitally important role to play in our efforts. CH : This work is my life’s passion. I could not see me doing anything other than what I do. I get so much satisfaction when I hear anyone speaking the language, from the children to the adults. I am grateful for the opportunity to be working so closely to something that is so important not only to me, but to many people in my family and my community. MI : How have the youth, adults, and elders reacted to your efforts? CH : There is a group of people who I credit for the original push for language and cultural opportunities in the community back 10-15 years ago. These people are now in their 30’s and they are the ones who are raising their children with language and culture. For the past few years there seems to be another group of young people who are very interested in learning the language and culture. This is very exciting for us. I think it is critically important that young people gain this knowledge prior to having children in hopes that they will raise their children in our language and our ways. Our language is not safe until we have a complete generation of speakers, and ideally this will be children who continue the process by teaching and speaking to their children. MI : What has been the most important thing you’ve learned through this project? CH : I have learned that nothing good is easy! I think my mother used to say that! We have had our struggles along the way, but the satisfaction of hearing the language being spoken by children or hearing it at the store is so satisfying. We have come from a community of virtually no speakers to one where language can be heard in many contexts. We are now able to conduct our ceremonies at our longhouse totally in the Mohawk language. It can sometimes feel as if we are making no progress so in those times it is important to reflect on where we were ten years ago compared to where we are today. It is nothing short of amazing, and it is the combined efforts of every person in the community who has made the revitalization of language a priority in his/her life. MI : What would you like to do next, or where you like to see the revitalization projects head next? CH : I am currently working on my Masters in Indigenous Language Revitalization through the University of Victoria. My project has been a community wide survey on the health, status and vitality of the language, and I am hopeful that I will be able to use some of what I have learned through that process to create more opportunities for people in our community in terms of revitalizing and regenerating our language and culture. Callie hits on many points that are an essential part of the revitalization of any language. Perhaps most importantly that it isn’t easy! This project was started by a dedicated and small group who refused to allow their ancestral language to disappear. For them, it was worth their time and effort to save, and they worked very hard to reach that goal. As Callie says, if there is a committed group of people willing to work toward preserving and revitalizing the language then the language will be saved. Callie has no doubts that Mohawk will be saved, and with people like her working toward saving languages, I have no doubts either. She also mentions that in the “materialistic, economy-driven” society that we far too often embrace there are those who might not value this kind of work. Some people see Mohawk, and any other language, as a means to an end—of gaining employment or economic gains. But to me this feels wrong. People don’t only learn (and shouldn’t only learn) a language because it is economically valuable. Language learners should be able to see the social and personal value of their language. The Mohawk language has significant cultural value for the people whose ancestors spoke it. This is a tremendous benefit that can’t easily be measured. Thank you to Callie for her time for this interview. Her work is invaluable to the fabric of the story of us as Ontarians, Canadians, and ultimately as human beings. Chloë Ellingson is a documentarian and photographer. Her work has appeared in Newspapers, for events, and she recently discussed a project on Radio Q. Her most recent work has involved the study of a revitalization effort being conducted on the Mohawk language by the people of Tyendinaga. She created a thoughtful documentary which reflects upon the importance of a language for a people, how a language can be saved, and what kind of people it takes to make it work. I was able to ask Chloë about her new film. The documentary is called Raising the Words (This comes from the name for the two-year adult-immersion program, Shatiwennakarà:tats, which translates in English as “they are raising the words again”). Michael Iannozzi : What led you to study the Mohawk language revitalization project? Chloë Ellingson : I first became aware of the Mohawk language [known as Kanien’keha in Mohawk] revitalization in Tyendinaga through my relationship with two people who ended up studying Mohawk – Margaret and Ellie. I met them in 2011 for a photographic project I was working on about grandparents who are raising their grandchildren. I was studying photojournalism at Loyalist College at the time, which is in nearby Belleville, Ontario. Margaret and Ellie were really excited about the language programs, and talked often about what they were learning. It took about a year for me to commit to the idea of working on this project, as I had sincere reservations about taking on a subject that was so removed from my own life experiences. Ultimately, I realized that hearing about what was happening in Tyendinaga was having a powerful impact on my perception of Canada, the depth of the imprint of colonialism, and also what it means to speak a language more broadly. At a certain point I felt that these realizations were too important not to share, and I had met people who were willing to share their stories with me. I started shooting this film in August, 2013. MI : Where does the film take place? CE : The documentary is called Raising the Words. It takes place in Tyendinaga Mohawk Territory, which is about 200km east of Toronto along Highway 401. Tyendinaga is home to roughly 2200 people, however there are many more people who are also Bay of Quinte Mohawks, but live elsewhere. It is one of the six Mohawk territories within Canadian borders. MI : Had you spent much time in small towns before filming this documentary? CE : Other than the short time I had been living in Belleville? Absolutely not! I had spent my life living in only big cities up to that point. All the open space and a dependence on a car was quite an adjustment for me. MI : Going into the project, how much did you already know about the Indigenous languages of Canada? And specifically of Mohawk? CE : I knew nothing about Indigenous languages in Canada, and certainly nothing about what was being done to revive them. I had no sense of how Mohawk related to other Indigenous languages, where people spoke it, or what it meant to communities of Mohawk people – and this is what got me into the project. It wasn’t an interest in the language itself, but an interest in what the language means to people. The more I learned about the value it held, the more my curiosity grew. The life experiences of the people I’ve spoken to in the film have illustrated that language is about much more than communication. It’s a connection to culture, to ancestry, to self. Some of the people in the film see learning the language as a political act, and as an essential part of connecting with their Mohawk identity. MI : Did you experience any challenges in filming this project? CE : I experience challenges constantly. Some of the challenges are about figuring out how to piece this film together as a first-time filmmaker. I’m used to working with the medium of photography, and there are some huge differences to grapple with, such as the need to plan and do things in a pre-meditated fashion, rather than being able to have a more intuitive approach. There are more profound challenges as well, like the need to try to work away from the exoticized, distancing representations of Indigenous peoples that have plagued visual representations of the past, and continue to do so. This is a haunting challenge because I fear that the prejudices I’ve been surrounded by throughout my life could be coming out in in ways I’m not aware of. MI : The people who form the basis of the film, what has been their reaction to beginning to learn the Mohawk language? Why is it important to them? CE : From what I gather there are several motivations, but the overarching one is something I can’t describe, that I’ve only been able to vaguely bear witness to, and it has to do with addressing a profound need to feel like oneself after a tremendous, violent loss. I know that there are sub-motivations at play such as wanting their children to have access to opportunities they never did, to connect with culture, to live out the change they want experienced in the community on a broad scale.Important to note is also “the cool factor” that the language has now, as teacher Nathan Thanyehténhas Brinklow puts it. As he says in the film, the kids of ‘80s and ‘90s “grew up post-dramatic racism, post native-awakening, at a time where it started again to be cool to be native.” It’s this generation, he says, that has been raised in a context that allows for language revitalization. MI : What has been the hardest part of putting this together? CE : The hardest part is grappling with the fact that I talk, write, and think about this project in English. I think the work has value even coming from this standpoint, but it’s strange not to be contributing to the revitalization through what the film is, rather than just what it says. MI : What has been the biggest surprise, or new thing that’s come from your work on this? CE : It’s been surprising to me to hear some of the thoughts about my project from people I know who I otherwise consider to be very open-minded, curious and worldly people. One friend asked, after hearing about the work, something like, “But isn’t it normal for languages to die out through the course of history?” I’ve come to believe that this is totally missing the point. There are real people who care about their language and are fighting to keep it strong. Why entertain notions of whether or not it matters on the scale of total human history if it clearly matters to a people today? MI : Who is this project aimed at? Who do you hope will be the audience for this film? CE : I find this question very difficult to answer, because I’ll be happy for anyone to watch the film, and I can’t predict who will get something out of it and who won’t. That said, if the standpoint from which it was made can be an indication of the answer to your question, then I’ll say that this film came about through a realization that language revitalization is happening. It has tremendous value to those involved. Learning about these efforts at revitalization is a window into exploring the current impact of colonialism, and a desire to explore and share the life-affirming and moving stories of a few people who are involved in language revitalization in Tyendinaga. A sincere thank you to Chloë for taking part in this interview. This blog has usually focussed on the work of academics and researchers, but it is important to speak also with people involved in language in other ways. The Mohawk language is absolutely important to the people in Tyendinaga who are the subjects of Chloë’s film. They are spending their time and resources to try to revive their language, and to help people appreciate the importance that language has to Mohawk identity–both inside and beyond their community. These languages aren’t endangered like a species that isn’t surviving due to natural selection. There has been nothing natural about the suppression that Indigenous languages have underwent that created a situation in which so many are now on the edge of extinction. Efforts like those taking place in Tyendinaga hope to restore a language’s place in its community, and efforts like Chloë’s hope to inform those involved, and the public at large, that these languages can be saved, but they need our help. Information on how and where to see Chloë’s documentary can be found Here. It’s likely that every frustrated student has at some point thought “when am I ever going to use this? This week’s post is an example of how students put what they learned to real use in a way that benefitted a community, and an entire language. In 2012, a group of students from a University of Toronto undergraduate class on language revitalization took what they learned in the classroom, and shared their knowledge with language activists. 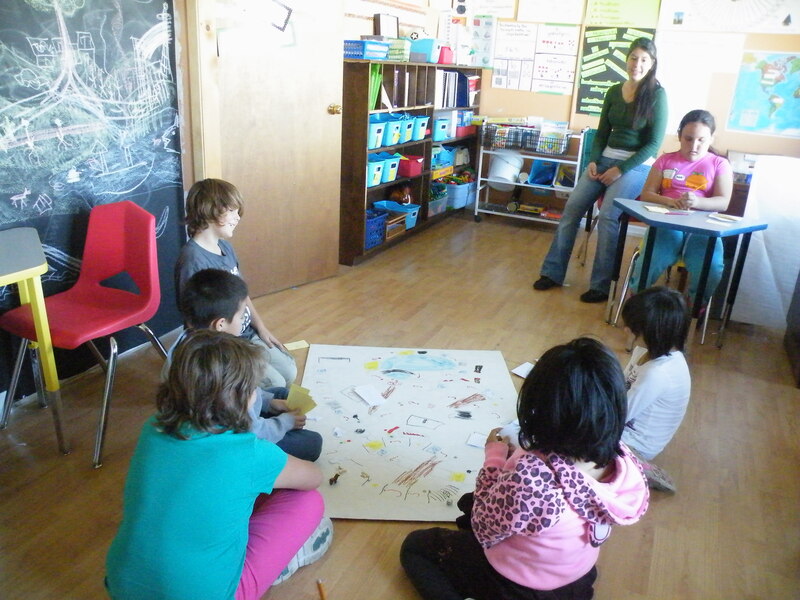 They decided to work on the Ojibwe language with the help of Revival Program Coordinator Alan Corbiere. Ojibwe is a polysynthetic indigenous language, meaning that that different parts can join together in one word, which means words can look big and intimidating to English-speakers. For example, “He listens to the other one” could be expressed as a single, large word (obizindawaan). I was lucky to speak with Paulina Lyskawa, a graduate student at the University of Toronto, about the project her and her classmates worked on, and continue to work on, with the help of Professor Alana Johns. 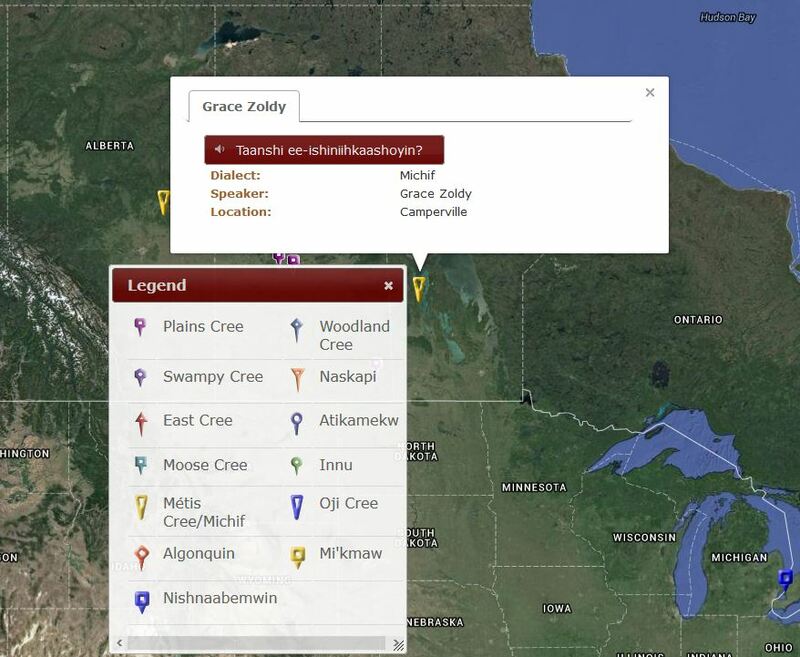 The result of the project was a website of traditional Ojibwe stories called Baadwewedamojig that have been transcribed and translated, some for the first time in a century. Michael Iannozzi : To start, what is Ojibwe? Paulina Lyskawa : Ojibwe, or Anishinaabemowin, is one of the First Nations languages spoken in Canada and the US. PL : It depends how you count of course. We have found that people are very shy to report that they speak any Ojibwe because they think they are not proficient enough, whereas in fact, we thought that they can carry a conversation quite easily. The crucial thing is that Ojibwe is doing relatively well compared to other indigenous languages of North America; perhaps because there has been a lot of effort into its revitalization. So we see that it has been worthwhile and we want to contribute a bit more. PL : We quickly learned not to be intimidated by these long, long words and soon we started intuitively, and often correctly, breaking them down into their appropriate. It was crucial for two reasons – if for some reason we wanted to double-check the meaning in the Ojibwe People’s Dictionary, we had a better chance to do it by root. PL : Ojibwe is an Algonquian language, so it is closely related to Cree as well as Mi’kmaq, Blackfoot and many others. MI : Now turning to you, what first got you interested in the study of Ojibwe? PL : It started with the course LIN 458 (Revitalizing Languages). The course shows that various indigenous languages around the world face similar problems. We hear a lot of stories in the media like “The last speaker of X died.” But they rarely dig deeper into the story of what had been happening to this language before it came to the verge of extinction. Alternatively, we hear stories about communities that are successful in their attempts to bring the language back like the exemplar case of Māori or Hawaiian, but we don’t realize how much effort it entailed, and that the same methods cannot always be replicated 1:1 in another language. I, before taking this course, didn’t know much about the problems of indigenous languages in Canada, because I didn’t grow up here. So I learned A LOT. MI : And your project “Baadwewedamojig”, how was it built? 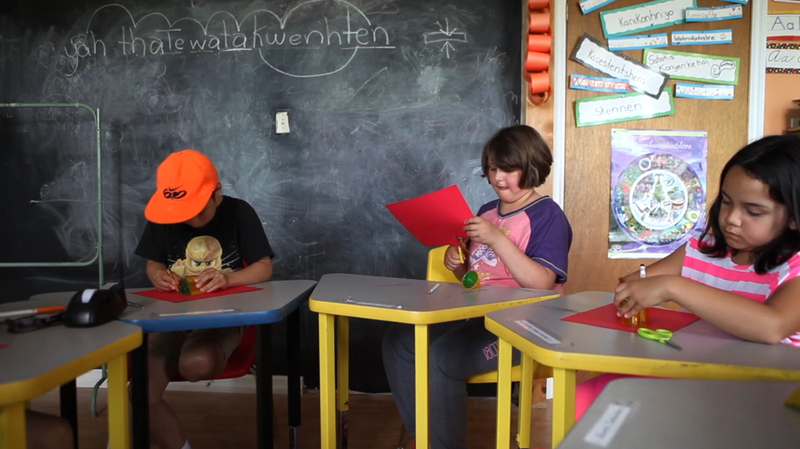 PL : The class started with documentaries and academic literature on language revitalization – why languages become endangered, whether there is any sense in preserving or revitalizing them, and, if yes, how to go about it. From early on, we were thinking of what final group project we could come up with to put our newly acquired knowledge to use. Then, Prof. Alana Johns met Alan Corbiere, a scholar and an Anishinaabe from M’Chigeeng First Nation. He came up with the idea of how to utilize the skills of Linguistics major students in a project that he started some time before. MI : What are the Baadwewedamojig project’s goals? PL : He showed us a collection of Ojibwe stories transcribed by a linguist, William Jones, at the beginning of the 20th century. It is quite important knowing the fact that while the culture of story-telling is very rich, it is mainly oral. Imagine, what an amount of work and expertise Jones showed by listening to various stories told by at least two different speakers, and being able to transcribe it phonetically. Nevertheless, it is hardly of any use for Ojibwe speakers nowadays, because the kind of phonetic ‘code’ Jones used is bizarre and not familiar to linguists nowadays. So first, a sub-team of students came up with a systematic key to decipher these transcriptions based on Alan Corbiere’s previous transliterations of a few stories and we added to it as we went along. Alan, being the only person on our team who actually spoke Ojibwe, had to proofread everything and sometimes consult more proficient speakers. MI : What is the role of the linguist and what is the role of the community elders in a project like this? PL : I really liked that the idea came directly from Alan, the member of the community rather than us, which would have felt like non-speakers imposing our opinion that their language needs our help. And particularly, despite the fact that very few people knew any words in Ojibwe, we were still able to help! I was so proud that my linguistic knowledge could be applied in such a cool and important project. MI : In a class of linguistics students, what was the main challenge to working on this project? MI : And what was the main advantage? PL : Alan Corbiere filled us with his enthusiasm, and he is such a dedicated person we really feel that we did a good job. Working under the supervision of Alan, as well as Prof. Johns, was great because they are absolute experts in this field. MI : What are the advantages of modern technology and the internet in building tools for a language? PL : The stories are a great teaching tool. 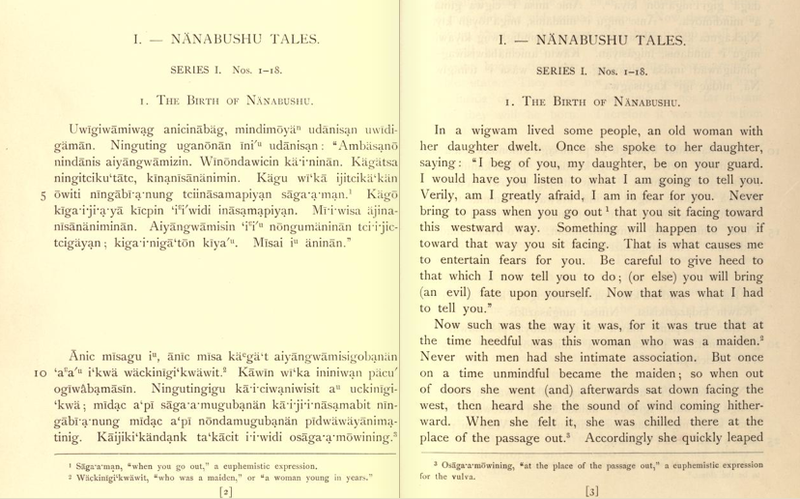 Each one is easily accessible in three different formats: first, each sentence in Ojibwe can be immediately followed by a translation in English, which is great for less proficient speakers or for careful language analysis; second, a column of Ojibwe text next to an English one for more advanced speakers; as well as an Ojibwe-only version, for example for cultural teaching to speakers of all levels. Furthermore, some stories are available in two versions – classic and Manitoulin Island dialect. Finally, increasingly, more stories are now available with sound files recorded by a native speaker. MI : From a purely technological point-of-view, what have been some of the challenges (in terms of hardware and software) in building this website? PL : Technology is transient. Take CDs for example, not every computer has a CD reader nowadays, let alone some other older technologies like tapes or floppy disks. Similarly with software, once a program is outdated, some file formats may not be easily opened. So as a long-term goal, we have to stay on top of things, and if our website keeps being used, it will need to be updated accordingly to new technology. As a short-term goal, we had to keep in mind that some people will leave the project and new ones may join, so all the procedures had to be transparent. MI : On the website I see that there is a decision to include audio, why is it important to have audio files? And how does this impact interactions with the website? PL : Having a spoken component gives another dimension to language learning. I can imagine that for self-study, it is an essential piece. For example, many of the students we asked reported that they do study from home – they may not have Ojibwe classes offered in their neighbourhood or perhaps they prefer to do it in their own free time. Every English as a Second Language textbook has audio with it so why not Ojibwe? MI : If someone wants to learn Ojibwe, what do you feel is the best approach, and how should someone get started? PL : I know it is easier to say than actually do. I started learning some indigenous languages myself and as soon as I took a break, it all went away immediately. Similarly, for many foreign languages; however, with many of those the resources are much more plentiful. It is very, very, very hard, so good motivation and commitment is the key. PL : The stories are absolutely hilarious. One can easily imagine the main character, Nanabushu actually going through all the adventures. Just read it! An example of the writing system (on the left) that had to be updated. A sincere thank you to Paulina Lyskawa and the whole LIN 458 class of 2012. In this linked article, Paulina I think brilliantly summarizes the project and all work that involves peoples or communities, “It’s crucial that if we linguists study languages to develop our own field, at the same time we give back to the people behind these languages”. She is absolutely right. When people share their homes, community, and language with a researcher, they absolutely must be sure that the community is treated fairly throughout, and that the linguist’s skills and findings are used to benefit the community as much as possible.